Today a Swedish and well-visited newssite, AftonBladet (http://www.aftonbladet.se), was compromised and serving visitors a fake antivirus or rogueware. When trying to reproduce, it appeared it already was cleaned up, fast actions there. Thanks to my Panda Security colleague Jimmy from Sweden, I was able to obtain a sample. This rogueware or fake AV belongs to the Tritax family, which has been going around for quite some time and has lots and lots of different names, but the design, concept and initial social engineering attack are all the same. If you are having issues doing this, reboot your machine in Safe Mode and remove the malware. For any other questions, don't hesitate to make a comment on this post or contact me on Twitter. Follow the tips above to stay protected. I have developed a small tool that will aid you to remove VBS malware (and unhide your files) from a machine, external drive (USB eg.) or in a network. I created the tool some months ago when I saw quite a lot of these doing the rounds. Plug in your infected USB (if any) and choose A (wait), then B (wait) and afterwards C.
After these steps, perform a full scan with your installed antivirus product or perform an online scan.
! When you use option B, be sure to type only the letter of your USB drive! This option will eradicate any related malware on the USB drive, as well as unhide your files (make them visible again). With option C you can download Panda USB Vaccine to prevent any other autorun malware entering your computer. With option D you have the possibility to disable or re-enable the Windows Script Host (WSH), to prevent any malware abusing it. When the tool is running, do not use the machine for anything else. 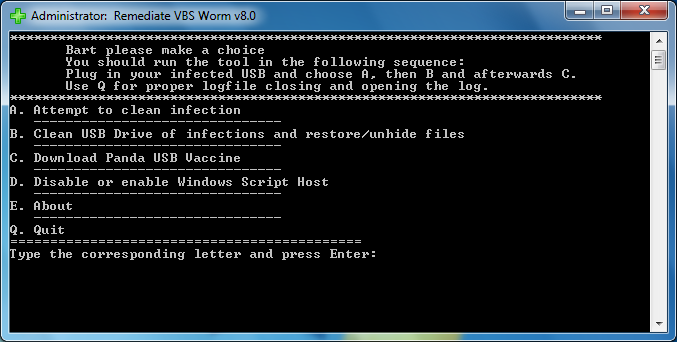 If VBS malware is found, it will be automatically removed and a copy will be placed at C:\Rem-VBSqt. Accidentally used an option and want to exit the script? Use CTRL + C to stop it. Install all your Windows Updates. If you aren't planning on ever using VBscripts at all, or you are not working on a company laptop (which may use scripts! ), you can also simply disable the Windows Script Host. You can use option D in my tool. Last but not least, install an Antivirus and update it regularly.